Surprises abound at the markets: scarlet vine-ripened tomatoes from Delta Junction, Matanuska Creamery's Caramel Cashew ice cream made using only milk from Alaska, steaming pots of homemade pozole and elote, blowsy ‘Flemish Antique’ peony poppies, freshly gathered duck and chicken eggs from Future Farmers of America. Among the abundance, golden squash blossoms stand out as a rare treat. 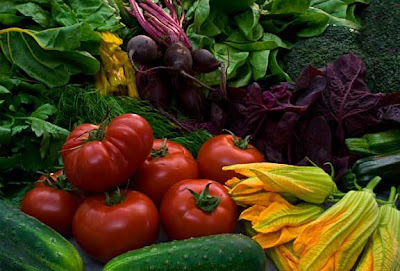 Never in stores, they're available only during their short season to home gardeners and farmers’ market shoppers. So far this year, only Rempel Family Farm is selling squash blossoms in Anchorage (50 cents each on Wednesday at Northway Mall Farmers’ Market and Saturday at South Anchorage Farmers’ Market). Delicate squash blossoms don't like plastic bags. If paper bags aren't available, wrap in newspaper. 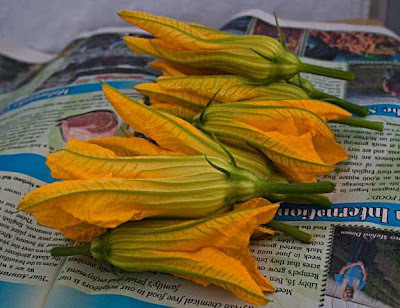 All squash blossoms are edible and may be used interchangeably. Because we grow zucchini at home, I’ve gotten used to calling them zucchini flowers. The more generic term, squash blossoms, is usually more accurate when buying from farmers who grow a wider range of squash. I love stuffing squash blossoms with cheese and cooking them until they’re crispy and oozing with hot, melted cheese. 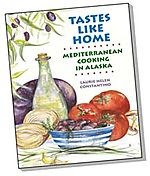 (Tastes Like Home: Mediterranean Cooking in Alaska has recipes for 2 different cheese fillings for zucchini flowers.) Herby essence of basil brightens the flavor of Cheesy Potato-Basil Stuffing for zucchini flowers, and pairs well with a side of fresh greens. Squash blossoms are also tasty dipped in a tempura batter and simply fried. 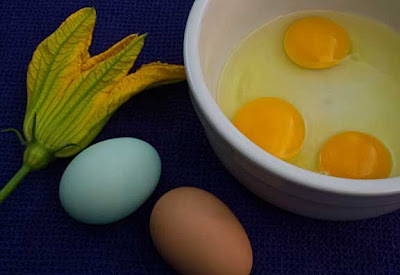 Blue and brown eggs from Future Farmers of America; both had deep golden yolks. On days when I want the flavor of squash blossoms, and don’t want to fiddle around or mess with hot oil, I make Squash Blossom Frittata. Today we had farm-fresh, golden-yolked eggs, fresh herbs, and creamy fresh goat cheese to pair with the squash blossoms. Sighs of satisfaction replaced conversation as we ate; I finished by licking my fingers, wanting more. Prepare the Squash Blossoms: If necessary, gently brush off dirt or debris from flowers; don’t wash or get them wet. 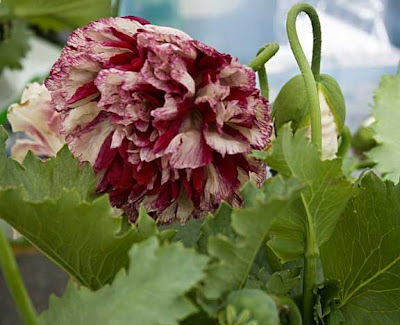 Carefully open flowers and shake out any insect hitchhikers. Cut off stems, but leave green bases attached. Prepare Eggs: Whisk together eggs and dill with a light seasoning of salt and freshly ground black pepper. Using a heavy 9-10” oven-proof frying pan (cast iron works best), sauté shallots, lightly seasoned with salt and freshly ground black pepper, in 1 Tbsp. butter until they soften and start to turn golden. Add sautéed shallots to eggs and whisk to blend (reserve excess butter in pan for cooking frittata). Cook Frittata: Preheat broiler to high. Melt remaining 1 tsp. butter in pan used to cook shallots, arrange squash blossoms in pinwheel around bottom, and cook over medium heat for 30 seconds. Turn blossoms, and evenly pour whisked egg mixture over them. Break goat cheese into pieces and scatter over eggs. Turn heat down to low, cover pan, and cook until eggs are almost set, but still runny on top, about 4-5 minutes. Put under broiler to finish cooking eggs. Flip out onto platter, garnish with dill sprigs, and serve. 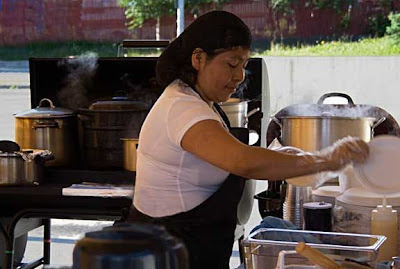 This post is included in Weekend Herb Blogging compiled by Cinzia from Cindystar. Wow, I had no idea! What a delicious discovery :) I'll make this once my blossoms come up in my garden. Thanks for sharing! Those squash blossoms are absolutely perfect; what a great idea. here in Italy zucchini flowers are veery popular and easy to find, I really adore them and can't resist to fry them in a light batter. Your frittata is gorgeous, sure an healthier way to enjoy them! Thanks for participating,hope to see you again at WHB!